As a winter storm of epic proportions blankets much of the nation in snow and ice this week, I wondered if I was ready for an extended power outage. Perhaps because the power flickered a few hours ago – giving me a scare and glimpse of what life would be like without electricity in the dead of winter. “Where are the flashlights?”, ” How will we cook if the electricity goes out?” (Wish we had a gas stove.) ” Will we be able to stay warm, or will we need to flee to the nearest warm hotel?” These are all questions that I pondered during a very brief powerless (no pun intended) life tonight. Food: Food that requires no cooking or refrigeration such as bread, crackers, cereal, canned foods, and dried fruits. Remember baby food and formula if you have young children. 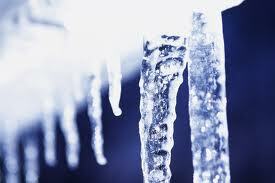 Water: In case water pipes freeze or rupture, keep a supply of tap water or purchase bottled water. The recommended amount of water to keep is 5 gallons per person. Medicines: Roads may be inaccessible for several days due to the storm. Make sure to order or refill any prescriptions that family members may need. Identification: Make sure to keep forms of identification with you such as social security card, passport, photo ID, and driver’s license. In addition, make sure to have bank account information, and insurance policies. Try not to travel alone. My home-preparedness kit is excellent, but I’d be in big trouble if I were stuck in my vehicle this winter. 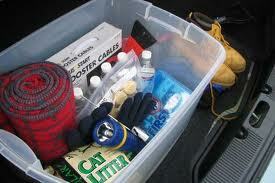 How do your home and vehicle survival kits fare? “Bring it on!” or “Yikes, I need help!”?